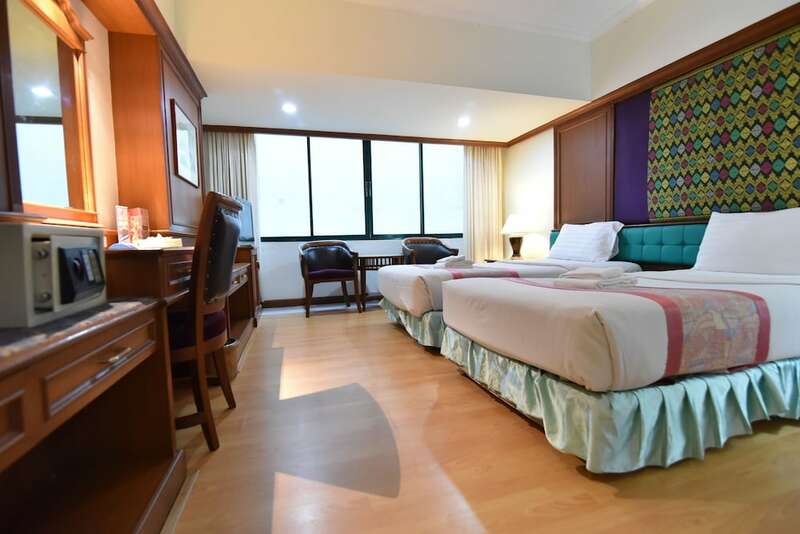 Located in Downtown Hat Yai, this hotel is steps from Ocean Shopping Town, Lee Garden Plaza, and Kim Yong Market. Bangkok Hospital Hat Yai and CentralFestival Hatyai are also within 2 mi (3 km). Hat Yai Railway Station is 7 minutes by foot. Along with a restaurant, this hotel has a bar/lounge and a meeting room. Free WiFi in public areas and free self parking are also provided. Additionally, concierge services, dry cleaning, and a 24-hour front desk are onsite. All 184 rooms provide conveniences like sitting areas and refrigerators, plus free WiFi and TVs with cable channels. Guests will also find minibars, room service, and coffee makers. The hotel offers a restaurant. A bar/lounge is on site where guests can unwind with a drink. Public areas are equipped with complimentary wireless Internet access. For a surcharge, a roundtrip airport shuttle at scheduled times is offered to guests. This business-friendly hotel also offers tour/ticket assistance, concierge services, and complimentary newspapers in the lobby. Complimentary self parking is available on site. Asian Hotel Hatyai has designated areas for smoking. Lucky - This restaurant specializes in Thai cuisine and serves breakfast, lunch, and dinner. Guests can enjoy drinks at the bar. Start your morning with a cooked-to-order breakfast, available each day from 6:30 AM to 10 AM for a surcharge. Room service is available during limited hours. Rollaway/extra beds are available for THB 500 per night. This property offers transfers from the airport (surcharges may apply). Guests must contact the property with arrival details before travel, using the contact information on the booking confirmation. One child 11 years old or younger stays free when occupying the parent or guardian's room, using existing bedding. No pets and no service animals are allowed at this property.